denisesgiftscom has no other items for sale. L A Conduct Girls Top - Excellent Condition! 60% Cotton, 40% Polyester. 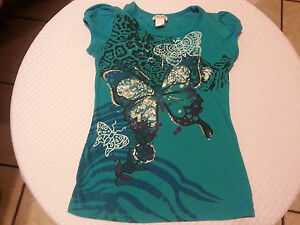 Short Sleeve Top - Size L. Green with front print - Butterflys/Glitter.